First-timers take the left rear seat. You'll know why once we're in the air." That was my introduction to flying in a helicopter. That and "Whatever you do, don't get out until the blades stop moving." I was feeling a mix of excitement and anxiety. You never forget your first chopper take off. Airplanes go straight forward and then a bit up. Choppers go straight up and then a bit forward. The experience was unnerving but I'll readily admit there's no better way to see Abu Dhabi than from a thousand feet high. A 30-minute ride gets you a bird's eye-view of the Corniche, Emirates Palace, the Grand Mosque, Yas Marina circuit, Ferrari World and many other places in between. Most helicopters in this swanky Arab city are specially-equipped for VIP tours and have well-planned itineraries. If you're interested in aerial photos, take a day-time tour. Longerexposure night shots are impossible with all the movement. Helicopter rides are the best way to set up your highadrenaline holiday in Abu Dhabi. For starters, you get a good idea of where things are in the city. More importantly, given how the rest of your weekend is going to look, it's a good way to get the blood going. Once you're back on solid ground, head over to one of Abu Dhabi's many malls or take a closer look at some of the sites you spotted from the air. 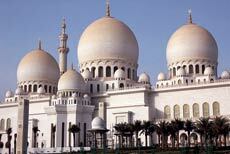 Sheikh Zayed mosque, for example, is one of the world's most elegant examples of Islamic architecture. Another option is that quintessential desert safari. Go dune-bashing aboard an SUV and stop along the way for camel rides, sand boarding and a campfire barbecue by sunset. Reserve the late evening on your first day there for a very special experience. The quiet waters off Abu Dhabi are a great setting for a romantic dinner cruise. 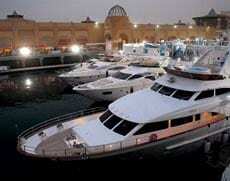 Most yacht companies offer a pick-and-drop from your hotel. Once on board, tuck into a grand meal prepared by a personal chef as you watch the sun go down. It's the ideal counterpoint to what lies ahead on Day 2. For years Abu Dhabi was just an after-thought; the industrial and unexciting step-sister to glamorous and flashy Dubai. Not so anymore. With just under a million people and more parks and beach front than you thought possible, this is a city on the rise. Much of the excitement is centered around Yas Island. In fact, as you will find out soon, the attractions here alone are worth the trip. Yas Island is also where you'd want to pick a hotel. There are at least half a dozen 5-star options including two Radisson properties, a Crowne Plaza and two others managed by Saudi Arabia's Rotana group. I stayed at the eponymous Yas Hotel. Owned by Abu Dhabi's own Aldar Group, it is literally located on top of the Formula 1 track. During the annual race, cars zip under a bridge that connects the two wings of the hotel and continue right around the property. It goes without saying that occupancy is 100 per cent on a race weekend. Another option, if you're traveling in a large group, is to rent out the Team Villas at Yas Marina circuit. These ultra-cushy and very luxuriant villas are used by VVIPs during the race weekend and are equipped with state-of-the-art everything. Charges range from 3,750 to 5,500 dhirams per night, depending on the size of the villa. What's more, they're located just behind the pit garage at the circuit; exactly where you want to be on the second day of your weekend. Enjoy an unparalleled view of Abu Dhabiâ€™s most famous landmarks; without any of the crowds. Treat yourself to a day at the dunes & an evening on the water. Safari-cumdinner offers begin at AED 450. Experience the thrill of racing on a brand new F1 track. Pick from a variety of race cars. Check well in advance to ensure avaiability of the vehicle. Arguably one of the worldâ€™s best amusement parks. 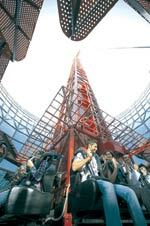 An adult ticket costs AED 225. An additional AED 85 buys you time on the state-of-the-art F1 car & Ferrari F430 simulators. Etihaad Airways offers direct flights from eight Indian cities to Abu Dhabi. Alternatively fly to Dubai and take a 1 hr 15 min taxi ride to Abu Dhabi. Yas Island has half a dozen 5-star options. The Yas Hotel sits right on the F1 track. Another option is luxury villas at the F1 circuit. Per day rentals start at AED 3,750. Get up early on Day 2 and make a beeline for the circuit. Here, you will spend the next few hours redefining life in the fast lane. If you want to experience the thrill of track racing first-hand, choose from an Aston Martin GT4, a Formula 3000, a Chevrolet Camaro, a Yas Supersport SST and a Renault Clio RS. Before the drive you will get a full briefing on track safety, car handling and correct racing lines. You also have the option of recording a video of your drive. A dashboard camera captures all your facial contortions while a front-facing camera picks up where you were headed. Do something crazy enough and you may even become a Youtube sensation. Of course, the ultimate experience on a Formula 1 track is to get around it in a Formula 1 car. Yas Marina circuit has a specially-built two-seater F1 car. Top speeds are well in excess of 300 kmph and the circuit claims you will pull up to 5Gs on some corners. This is not for the faint-of-heart. In fact, you have to undergo a compulsory medical and briefing by Formula 1-trained officials even though you'll only be in the passenger seat. For those interested in the innerworkings of F1, the circuit offers a guided tour of the pit garages, race control and even the winner's podium. Once done setting new land speed records, head over to what is one of the planet's best amusement parks. Ferrari World offers rides and shows that are high on creativity and energy. Hit the park as soon as it opens at noon. That way you beat the rush and get choice seats on the best rides. The most popular ride is the Scuderia Challenge. This features ten racing simulators where you can try out a variety of Ferrari cars or even simulate a group race around Yas Marina circuit. You need to book a slot and waiting times can hit two hours during off season. So it's best you go here right at the start to get your timed ticket. The more advanced simulators feature full-scale models of a Ferrari F430 and a Ferrari F1 car. These cost an additional 85 dhirams. Driving With The Champion is another must-do. It features simulator seats that recreate the experience of sitting in a Ferrari alongside none other than Fernando Alonso. I thought the attendant was joking when he asked us to buckle our seat belts. One minute later I realised he wasn't. Also try Speed of Magic. This 4D ride takes you through several animated 3D fantasy landscapes and features not just simulator seats but also wind generators and water sprays to create a real sense of motion. If you're going with kids, there's plenty on offer including a junior 'driving school' and a mini racetrack. There are also two roller coasters. Fiorano GT Challenge, the smaller one, features parallel tracks with the two coasters crisscrossing just a hair's breadth from each other at nearly 100 kmph. The bigger coaster, Formula Rossa, is the fastest in the world. At launch you go from 0-240 kmph in 4.9 seconds. That's faster than a Formula 1 car. As a precaution riders must wear plastic goggles to protect their eyes from the wind or insects. Ferrari World also has several museums and galleries which delve into the company's racing and manufacturing history. And if you ever get hungry, there are numerous restaurants, including four that are run by Michelin-starred Chefs. If fine-dining isn't your thing there is a fast-food joint and plenty of concession stands as well. A good way to unwind after such an adrenaline-pumped day is back at your hotel spa. Indulge in a few deep massages to work out the kinks from all those extreme Gforces. Once you're done, book a cab to the airport and get ready for a week of unstoppable bragging. There's really no reason not to travel to Abu Dhabi. Where else can you spend a weekend high on adrenaline? Shift gears and head to Abu Dhabi. You're guaranteed the time of your life.